A more affordable coastal cruiser you won’t find anywhere. 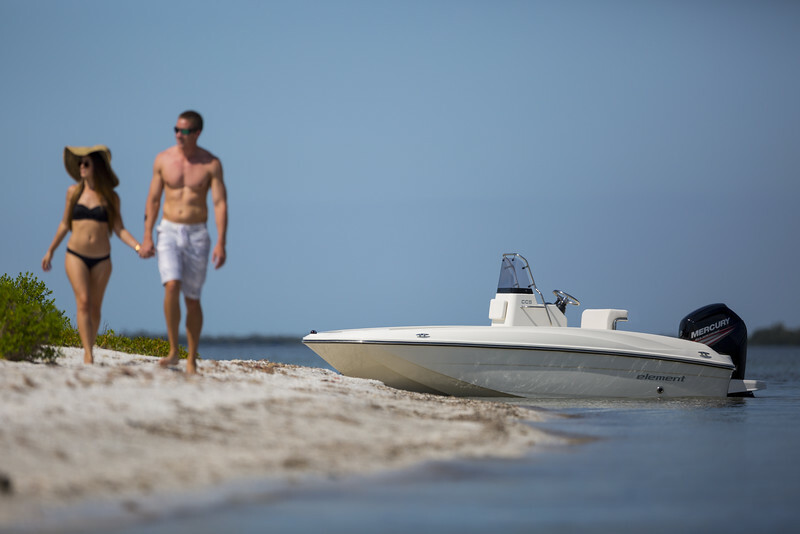 The Element CC5 joins its larger sister, the CC6, as the second in our new series of self-bailing, center console designs aimed at coastal cruising and other day boat activities. Its clean, open layout and roomy bow section considerably expands the capacity of the bow area including an anchor locker, and two, large bow storage lockers. The whole section is covered by a large bow cushion/sunpad making an ideal lounging area. The boat’s aft section features a leaning post at the helm station, plus twin jump seats flanking a roomy lined storage compartment ideal for snorkeling gear or other provisions. Dual swim platform extensions make boarding from the water easier. Our optional F5 Fishing Package converts the CC5 to a great bay fishing boat making this one as versatile as it is affordable.